In the first installment in my “Understanding ETFs” series, we toured the Canadian equity ETF landscape, covering solutions you can use for your investment portfolio’s domestic stock allocation. Today, I want to switch gears and head south of the border, to explore some of the U.S. equity ETFs you can add in, to diversify your Canadian-heavy portfolio. In our last episode, we learned Canada created the world’s first ETF in 1990. The U.S. wasn’t far behind us though. In January 1993, State Street Global Advisors launched the first successful U.S.-listed ETF – the SPDR® S&P 500® ETF, or SPY. The SPY mission: to follow the S&P 500 Index, which Standard & Poor’s created in the 1950s to track the performance of around 500 larger U.S. companies. SPDR (pronounced “spider”) is an acronym for “Standard & Poor’s Depository Receipt.” It’s trademarked by Standard and Poor’s Financial Services, but the acronym is so popular, it’s often confused as a generic term for any S&P 500-tracking ETF. SPY’s largest holdings include a number of familiar names most Canadians will instantly recognize. Whether you are investing in U.S. or Canadian dollars, there are quite a few ETFs that track the S&P 500 Index and trade on either the U.S. or Canadian stock exchanges. Each company in the S&P 500 Index is weighted according to its “float-adjusted” market capitalization. 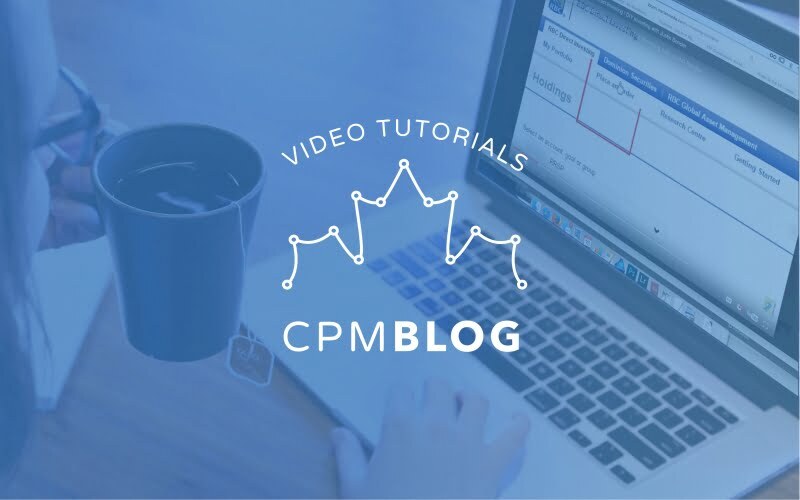 For more information on float-adjusted market caps, please watch my last video or read my blog post on Understanding Canadian Equity ETFs. As if the thought of spiders taking over the planet isn’t creepy enough, let’s add some venomous snakes to the mix. Not to be outdone by the success of the SPDRs, Vanguard launched their own version of ETFs in 2001, originally known as Vanguard Index Participation Receipts, or VIPERS for short. The Vanguard Extended Market ETF (VXF) was the second ETF Vanguard launched. You may be familiar with some of its holdings as well. VXF complements SPY by following the S&P Completion Index, which in turn tracks the performance of over 3,000 U.S. mid-, small-, and micro-cap companies. By allocating about 82% of your investment dollars to SPY, and the remaining 18% to VXF, you gain float-adjusted market-cap exposure to most of the U.S. stock market, at an annual MER of about 0.09%. Good news for creepy-crawly lovers everywhere: There is a single index that follows a combination of the S&P 500 Index and the S&P Completion Index. It’s called the S&P Total Market Index. This index includes about 3,825 companies and covers the broad U.S. stock market. Luckily, there also are ETFs that invest in all companies within the S&P Total Market Index – so you can invest in one fund instead of two, and achieve the same goal either way. The iShares Core S&P Total U.S. Stock Market ETF (ITOT) trades on the U.S. stock exchange in U.S. dollars. When held in a tax-deferred account – such as an RRSP, LIRA, RRIF, or LIF – the usual 15% withholding tax on foreign dividends does not apply, saving Canadian investors about 0.26% per year in taxes. Its sister ETF, the iShares Core S&P U.S. Total Market Index ETF (XUU), trades on the Canadian stock exchange in Canadian dollars. When held in a registered account, the 15% withholding tax on foreign dividends is lost, resulting in a tax drag of about 0.26% per year. Both ITOT and XUU have lower annual costs than the weighted-average cost of SPY + VXF, which makes them more cost-effective alternatives to the multi-fund approach. In choosing between the two (ITOT vs. XUU), the decision is typically driven by the impact of foreign withholding taxes. That’s a complicated topic, beyond the scope of today’s discussion. But at the end of this post, I’ve summarized the estimated tax drag of several broad market U.S. equity ETFs when a Canadian investor holds them in various account types. You also can refer to our white paper on the subject, as well as our YouTube videos on the Norbert’s gambit strategy (a cheap way to convert your loonies to dollars for purchasing U.S.-listed ETFs in your registered accounts). Vanguard has also released a number of ETFs that provide similar exposure to U.S. equity markets. Their most popular ETFs follow the CRSP indices. CRSP stands for Center for Research in Security Prices. The CRSP US Large Cap Index includes about 602 U.S. large-cap stocks, so its exposure is very similar to the S&P 500 Index. 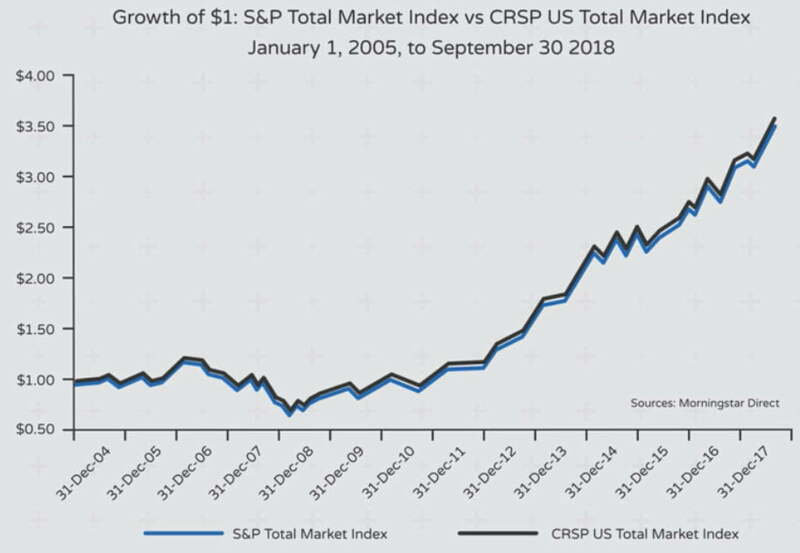 If you combine about 85% of this large-cap index with roughly 13% of the CRSP US Small Cap Index, and about 2% of the CRSP US Micro Cap Index, you end up with the CRSP US Total Market Index, which is very similar in composition to the S&P Total Market Index. Although Vanguard offers U.S.-listed ETFs that track the CRSP US Large Cap Index and the CRSP US Small Cap Index, they do not yet offer an ETF that tracks the CRSP US Micro Cap Index. That means combining multiple ETFs for total market exposure is not possible here. However, Vanguard does provide a pair of U.S.-listed and Canadian-listed ETFs that follow the broader CRSP US Total Market Index, tracking the performance of over 3,600 companies – including these missing micro-cap stocks. The Vanguard Total Stock Market ETF (VTI) trades on the U.S. stock exchange in U.S. dollars (similar to ITOT). When held in a tax-deferred account – such as an RRSP, LIRA, RRIF, or LIF – the usual 15% withholding tax on foreign dividends does not apply, saving investors about 0.26% per year in taxes. Its sister ETF, the Vanguard U.S. Total Market Index ETF (VUN), trades on the Canadian stock exchange in Canadian dollars (similar to XUU). When held in a registered account, the 15% withholding tax on foreign dividends is lost, resulting in a tax drag of about 0.26% per year. Again, remember that U.S.-listed ETFs like ITOT and VTI are only effective at reducing the foreign withholding tax drag in tax-deferred accounts such as RRSPs, LIRAs, RRIFs, and LIFs. Please refer to the end notes for a summary of the estimated foreign withholding tax drag when holding these ETFs in various account types. Why Go Global to Begin With? Before we wrap, let’s review why it might be worth adding in U.S. equity ETFs to begin with. In my last segment, Understanding Canadian Equity ETFs, I mentioned that nearly 75% of companies within broad-market Canadian equity ETFs were concentrated in the financial, energy, industrials and materials sectors. As shown in the chart below, the U.S. stock market is much more diversified across sectors, with only about a third of companies operating within these four sectors. By including an allocation to broad-market U.S. equity ETFs, Canadian investors can significantly increase the sector diversification within their overall portfolio. If you’ve made it this far, though, you are now probably wondering about the rest of the world, i.e., international equities which exclude North American companies. Good news: I’ll be covering that in my next “Understanding ETFs” presentation. Stay tuned! Justin can you break down XUU vs XUH, as I thought XUU was the Canadian hedged version of ITOT, but from what I’m seeing (and maybe I’ve got this wrong) its just ITOT converted to CAD. What do you recommend in this situation when you have CAD dollars to invest in a US Total market ETF in a TFSA. @Kosta: Both XUU and XUH trade in Canadian dollars on the Canadian stock exchange (but that doesn’t necessarily mean your actually currency exposure is Canadian dollars). When you purchase XUU, iShares converts your Canadian dollars to U.S. dollars, and purchases U.S.-listed U.S. equity ETFs (like ITOT) that trade in U.S. dollars. So you now have exposure to the U.S. equity market and U.S. dollars. XUH simply holds XUU. However, iShares also sells forward contracts on the U.S. dollar exposure of the fund (which is a fancy way of saying that they are shorting your U.S. dollar exposure). With your U.S. dollar exposure cancelled out, you now have exposure to only the U.S. equity market. In a perfect world, you would receive approximately the same return in Canadian dollar terms as a U.S. investor would receive by purchasing ITOT in U.S. dollar terms. Ah perfect. So to follow up would you recommend a 50/50 split between the two to have some diversity from the US Dollar impact? Assuming the complexity of rebalancing additional funds is not a an issues. @Kosta: Some investors prefer the “hedge of least regret” (i.e. the 50/50 you’re proposing). I tend to go 100% unhedged, as I find the US dollar exposure can actually make the portfolio less volatile for a Canadian investor. When constructing a portfolio using a combination of Canadian and US listed ETF’s, how do you determine asset allocation? In other words, if I’m building an all-equity portfolio that is 1/3 VCN, 1/3 ITOT, 1/3 IEFA with $300K, do I convert $100K CAD for each of latter two so that I have about $75K USD in each? Thanks. @Charlie: I’m not aware of any US-listed ETFs that are similar in composition to VBAL (you would likely need to combine 2-3 US-listed ETFs to gain the desired exposure). @Charlie: Thanks for the link (I wasn’t aware of these products). Generally, a Canadian investor would not want to invest in an ETF that did not hedge the fixed income foreign currency exposure. Is there a reason you want to purchase your ETFs using US-dollars (i.e. are you investing in an RRSP account)? We want to use incoming USDs from company stock sales and keep them invested in USD ETFS (non-reg account) to eventually buy a retirement property in Florida. TFSA’s and RRSP’s are all topped out in CDN. Thanks. @Charlie: Other than the small amount of additional foreign withholding tax drag on the underlying US-listed international equity ETF (and the potential T1135 CRA tax reporting requirements), I would expect the funds to be similar in tax-efficient to Canadian-listed asset allocation ETFs. Hello, I am wondering if you will be releasing a 2019 Modified Dietz calculator tool for users to download? It’s been an extreme help to me and I’m sure many others in the past 5 years. @Jeff: You can still use the existing calculator – the year column can be updated with 2019 instead of 2017. @Hemant Ghate: If you buy ITOT, you’ll have exposure to most of the stocks in the S&P 500 Index and the S&P Completion Index (the fund will take care of ensuring you have the correct underlying stock weights over time). Fantastic explanation Justin! I will admit I was not aware that the Canadian market traded versions of these US index ETFs (ie XUU and VUN) were subject to US withholding tax, even when held in my RRSP! For an RRSP portfolio currently around $50k, would you recomend using Norberts Gambit to purchase a US traded version of these ETFs to save the 0.26% tax? It appears that the US traded ETFs offer a more competitive MER as well, however this would add some complexity to my DIY operation. Thanks! Excellent articles. Looking forward to the 3 installment. Succinct. Reassuring. Informative. Keep them coming. @Curt: Thank you for the feedback – will do! @GMMT: You’re very welcome! I use both VUN and XUU in my clients’ portfolios (they’re also ideal tax loss selling pairs for taxable personal accounts) – you really can’t go wrong with either choice for broad-market U.S. equity exposure. Thanks again Justin for a most informative article. Can’t wait for installment number 3.